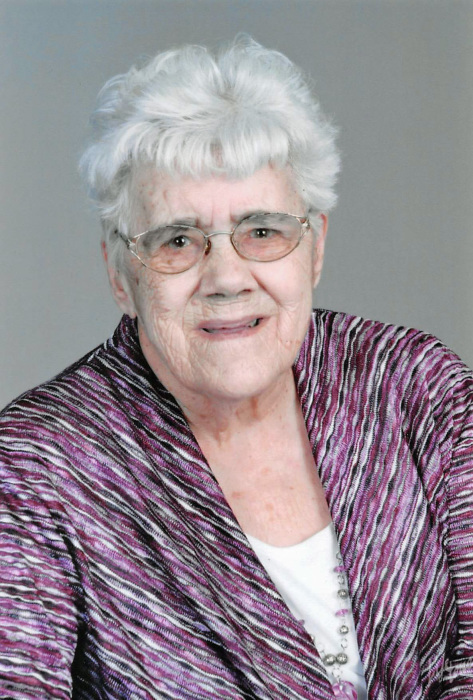 Lois Eileen Perrin, 89, of rural Ashby died Sunday, March 31, 2019, at the Evansville Care Campus, where she received excellent care. Lois and Norman Keith Perrin were married on July 15, 1950, in the Methodist Church parsonage by Pastor Elliot in White Pigeon, Michigan. They farmed and had dairy cattle until 1960, when they bought their farm by Ashby and moved the family, machinery and cattle to Minnesota. In fact, Lois traveled by herself along with the children to Minnesota, while Norman traveled ahead with the cattle and machinery. Lois took great pride not only in being an active part of the family farm, but also in raising her children. Norman and Lois enjoyed traveling, camping and bluegrass music and made many longtime friends, many that spent their winters in Texas with Norman and Lois. A highlight for her was traveling to Hawaii with her sister and nephew, touring four of the five islands. In her spare time, Lois enjoyed crocheting and crossword puzzles. She was a member of the Calvary Covenant Church in Evansville. She is survived by four children, Bill Perrin of Ashby, Linda (Tom) Wagner of Alexandria, Steve Perrin of Ashby and Patsy (Jeff) Ostenson of Ashby; special friend, Tina Norenberg of Ashby; twenty grandchildren; thirty great-grandchildren, with one on the way in November; two great-great-grandchildren; and numerous relatives and friends. In addition to her parents, she was preceded in death by her husband, Norman; grandson, Chad Wagner; brother, Leland Warren; and sister, Pauline Oxender. Funeral Service: 11:00 AM Saturday, April 6, 2019, at Calvary Covenant Church in Evansville. Visitation: 4 PM to 7 PM Friday, with a Prayer Service at 6:30 PM in Glende-Nilson Funeral Home in Evansville, and one hour prior at the church.